Soft... everywhere... except where you want it to be! Typically, when a manufacturer revises one of their most prominent and popular models, they'll trot out all manner of marketing mumbo jumbo in an effort to make you believe that they've reinvented the wheel. Sadly, since the most popular and prominent models in any manufacturer's lineup are typically the sedate sectors occupied by their family sedan and economy car lines, more often than not the biggest innovations you'll find is to cup holders and air vents. But when Nissan launched the all new Versa sedan late last year, they did it without the pomp and circumstance that many manufacturers rely upon, instead preferring to roll the car quietly into showrooms. Perhaps that was because visually, there was little need to remind the car buying public that this was a new Versa, seeing as it looks absolutely nothing like its older hatchback cousin. First off, there is the most obvious difference: the trunk. Whilst the previous generation of the Versa badge can still be found beneath the familiar five door hatchback layout, the new Versa has only appeared thus far as a regular old four door sedan. Dispensing with the hatchback's angular lines, the sedan appears to have been much more organically styled than nearly anything in the Nissan lineup (excepting perhaps the Rogue, Juke, and cube), and in stark relief, appears to most closely resemble a shrunken down version of Infiniti's range-topping M35 and M45 sedans. However, if you step outside Nissan's lineup, you find quite a few visual similarities between the Versa and another underrated Japanese economy car; the Suzuki Kizashi. However, while the Kizashi bills itself as a sort of econosports sedan, the Versa sedan makes no bones about its no-holds-barred approach to practical efficiency. With the availability of a rubber band (Nissan calls it a CVT) replacing a conventional transmission and a smallish 1.6 litre four cylinder producing 109 horsepower, the Versa sedan favours its miles to the gallon over its zero to sixty figures, and as a result, both figures are remarkably high. Likewise, the space-saving wheelbase and suspension setup leans heavily towards interior space and ride compliance more so than it does spirited driving, meaning body control and steering feel are best described as merely extant. But, at the lower speeds demanded by inner city traffic, the suspension does a pretty good job of handling the car's girth, and the quick, light steering really makes manoeuvring the Versa sedan a low-impact exercise. 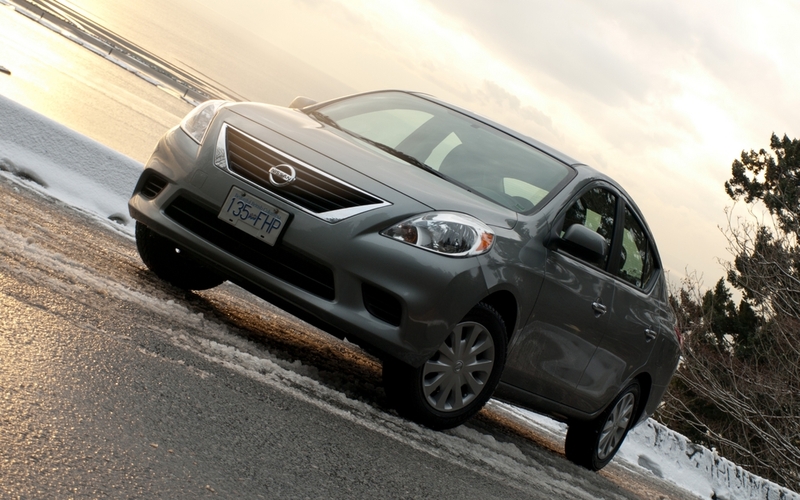 But, without a doubt, the Versa sedan's greatest feature is its downright expansive interior. Now, I know us automotive journalists throw hyperbole around with a frequency that's only bested by an election-bound political candidate... but sometimes we're right, and in the case of the Versa sedan, I am. Standing a relatively average 6'1" tall, I rarely have trouble finding a comfortable position behind the wheel of a car, but I just as rarely expect there to be any additional room behind me. In the case of the Versa sedan, I actually had to get in the rear seat, and then clamber back into the front seat to ensure that it hadn't moved forward somehow. It hadn't, and I found a pretty decent four or five inches of airspace between my kneecaps and the seatback. That's as much as I get in a Range Rover or BMW 7-series. And it was comfortable, too. Well raked and loaded with headroom, the back bench was easily the equal of the front bucket seats in regards to comfort for full sized adults... so long as you didn't try to wedge a third passenger in there too. In fact, over the passage of a week's time, the back seat proved itself the place to be, and not for the reason that you're probably thinking. See, in the back seat, all you're subjected to is the giant windows and pretty well styled door panels. But, from the front seats, you're faced with an expanse of hard, pebbly plastic the likes of which I've not seen for some time. Honestly, while the steering wheel was alright with its highlights of silver trim, the rest of the dashboard was a pretty morose affair that didn't do much to separate itself from the seven year old design I'd recently encountered in the larger Sentra. Just like that car's interior, the Versa leaves little to be desired in terms of practical usage, but it really could use a little dressing up, especially seeing as it occupies one of the most competitive segments out there.